What would you say about a nice fresh salad to start the year on the right food, and foot, and forget about perhaps the too many rich meals enjoyed during the Christmas and New Year celebrations? 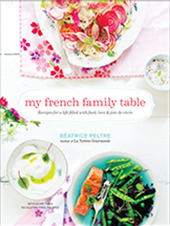 I have prepared a scrumptious one for you, and I talk about it in an article in today’s Boston Globe Food Section. It speaks about Fennel (and Arugula, and Apple), a vegetable that I am particularly fond of, in case you have not yet noticed (see more recipes below). Then the salad is simple to toss together, and fresh, fresh, fresh! You find crispiness in the apples and fennel, spiciness in the arugula, and welcomed crunchiness in the roasted almonds. 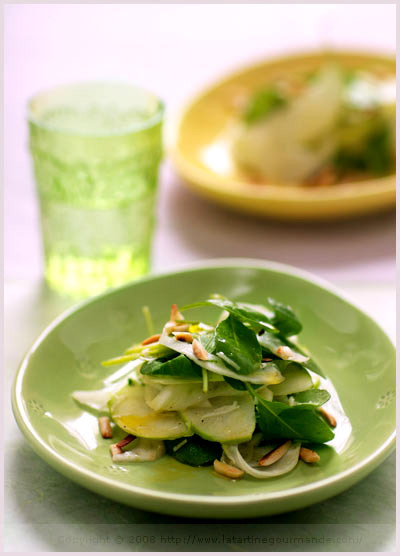 Read the recipe here: Fennel, Apple, Arugula Salad. Did I manage to have some of your attention and tempt you? Let me add how nice it feels to be back in my kitchen! Then, on another note, as I am trying to catch up with a lot of daily things, I have just found out yesterday that the Bloggies 2008 have started (well they did a while ago). It is this time of year again for us all to nominate our favorite blogs, in all sorts of categories, from country, craft, photography, food to only name a few. 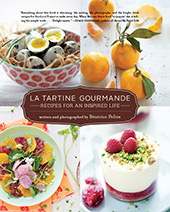 Yes yes, there are Food and Photography categories! We are not forgotten! The nominations close at 10:00 PM Eastern Standard Time (GMT-5) on Friday, January 11, 2008. Anyone can nominate their favorite blogs, and be nominated (see the rules). So why not? we made a fennel salad for christmas as an appetizer, using sauteed fennel and sliced oranges! it was terrific — i bet it would be great with apple! I too am a big fan of fennel. This is a delicious looking salad, fennel and arugula are a perfect match. Lovely looking salad. Very refreshing. This looks like a beautiful winter salad! And- I’m so glad your’re back and cooking again! Cette petite salade effectivement fait du bien après tous ces chocolats. Une découverte de plus les nominations bloggies. One of my favourite salads ever. Your dressing sounds lovely and light. congrats on this Bea. The salad looks very refreshing.